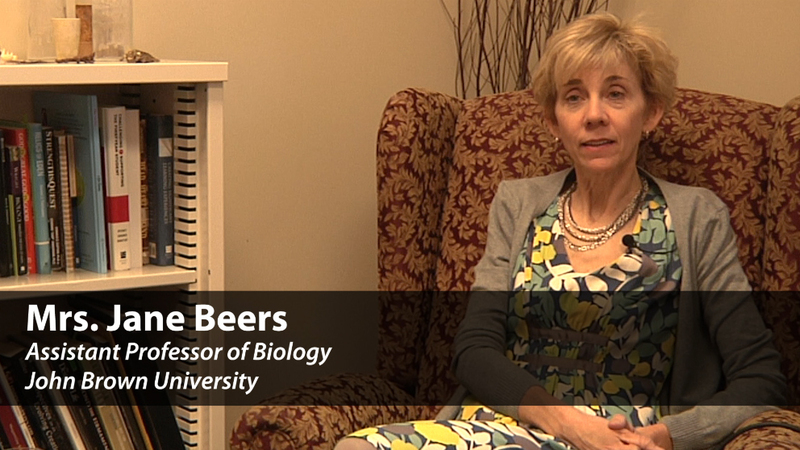 I am Jane Beers, and I have a background in Biology and a M.S. in Biology with teaching science, and so I have been teaching here since we came so this is my thirteenth year. Science and faith are complementary, in that they both are looking at reality, and that science really addresses the how questions, and our faith addresses the why and the purpose questions. All truth is God’s truth, and I think in science you can really see that there is truth that we can discover through science about the natural processes, and how the world works. I try to bring in the newest stuff to my students, because in three to five years when they’re out, when they’re out in the world this is going to be continually dialogued about and if they’ve never even heard of it, you’re not an educated person. What I love about JBU is just the community aspect of it. Everybody here from the top down really has Christ over all, and head, heart, hand. And it’s just a really mission-driven place. Students at JBU are fun to teach. They come in with lots of different perspectives. I just enjoy interfacing with them, encouraging them in their journey of faith. I had one yesterday that had just found something on Youtube that he thought was interesting and he just sent me the clip. And I love that, because that just shows me that I’m getting them excited and interested, that wow, there’s this really cool world out there and I can learn about it.